By now Tim Burton's Alice in Wonderland is unspooling to midnight crowds in theaters across the country. And doubtless it will do huge box office business this weekend and have lots of fans. But for me, it just didn't work. "Alice, I have a feeling we're not in Wonderland anymore." As someone who loves Disney's 1951 version of Lewis Carroll's classic, I didn't exactly expect them to try to do justice to that film, but what surprised me was this film's complete lack of whimsy and wonder. Alice in Wonderland has always been a bit dark and bizarre, but Burton seems to be going for something more akin to The Chronicles of Narnia here, fashioning a grand, epic adventure that takes itself way too seriously, without any sense of fun or spontaneity (unless you call Johnny Depp's out of left field CGI enhanced break-dancing fun...which you might if you're five). Burton also gives no reason for fashioning this film as a sequel of sorts to the original Alice story, with Alice returning to Wonderland to discover that it has been overrun by the Red Queen, and its citizens looking to her to save them. If it sounds familiar, well, it's pretty much the plot of Prince Caspian, told with just as little humor and joy as that film was. Lewis Carroll's singular voice is almost nowhere to be found here. While the film is beautifully designed, and Danny Elfman's score is fantastic, it all just seems to be about the design rather than the story. The 3D adds nothing to the proceedings either, and only served to further enhance my dislike of the medium. The only real highlight here is Helena Bonham Carter's deadpan take on the perpetually bored, petulant Red Queen. Other than that, Alice in Wonderland is just another tired fantasy adventure with nothing to distinguish itself from the pack. 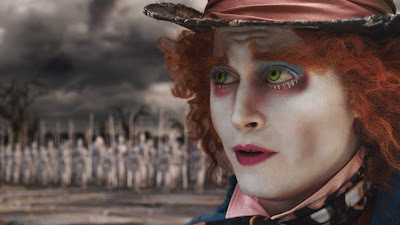 Even Johnny Depp's schizophrenic, overly made up Mad Hatter doesn't seem to register. It's just a missed opportunity on all counts. After reading this, I doubt you even knew there was second book. You would be wrong in that assumption.